Ivan stars in our 2018 Splat! Show Christmas special. The Tank is decked to the halls and ready to serve up some festive mess! Every year we like to stage a Christmas special. So when it came round to casting the guest for this years special we only had one guy in mind. Although he only made his debut on the show a few months ago, Ivan was the obvious choice for us. The loveable, crazy guy just happens to love Christmas too and he really seemed to enjoy his time in The Gunge Tank so why not? If you have seen Ivan’s first show you will already know his reactions are legendary. These legendary gunging reactions continue in this show, our Christmas special for 2018. We really hope you enjoy what Ivan and we produced for this years Christmas show. 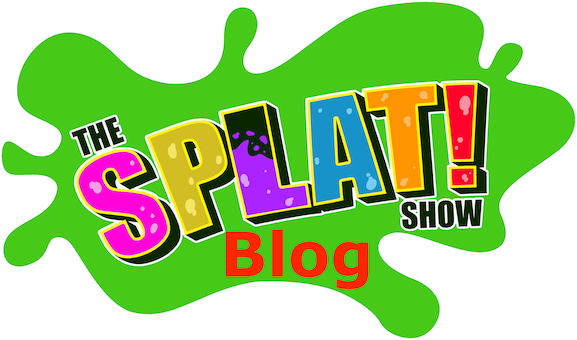 Everyone here at The Splat! Show wishes you a very merry Christmas. Thanks for the support this year! The Splat! Interview – Naughty Or Nice? It’s time to catch up with Ivan in our festive Gunge Tank. What has he been up to since his debut shoot with us? We find all this stuff out and more in this interview. We then ask Ivan to make a choice. Does Ivan think he has been naughty or nice this year? If the Gunge Tank disagrees with his choice then he will get gunked. He has to pull either the naughty or nice tinsel to make his choice. Ivan told us before the shoot that he is a massive fan of Christmas. But does he know enough about the festive holiday to avoid getting custard pies thrown at him? Ok so Ivan isn’t from the UK so it’s understandable he might not know some questions but how many pies will be sent his way? For each correct answer Ivan is given a golden Christmas Bauble and a Red one for an incorrect answer. If Ivan has more red Christmas baubles at the end of the quiz The Gunge Tank is triggered. This season we have been featuring one game more than others. Foam Me Up. Well we thought since it’s close to the end of the season we let it go out with a bang in a MASSIVE Foam Me Up special and turn Ivan into a abominable snowman in the process. It is Christmas after all. We asked Ivan to select the topic for the questions. Just how big will Ivan the abominable Snowman get before the tank has had enough? It’s been a while since the Splat! Balloon Game has made an appearance on the show. Ivan also hasn’t played the game so we brought it back for this years Christmas special. Ivan has 5 mins to pop the gold and silver Christmas Baubles just by sitting on them, all while being gunked and foamed. Failure will result in a tanking! Fresh from being slopped in Christmas Baubles, Ivan is interviewed as the show comes to an end. The Christmas hat has made a few appearances during the show but now it’s time for it’s starring role. The hat is filled with Gunge and foam. Ivan has to close the show by then putting the said filled hat on. The result? A very fitting and messy end to our 2018 festive special! Video Length: 1 hour, 10 mins and 59 seconds. Presented in 4k and HD. Help playing videos. Content Guidelines: Shirtless in some scenes. Occasional minor swearword usage. If we had to give it a age certificate: PG. Learn more about our Content Guidelines. Who's Ready for some Christmas Gunge Tank Karaoke? Ivan sure is! Splat! Fan Club members can watch Ivan take on Christmas Gunge Tank Karaoke. Ivan sings "All I Want For Christmas" while enduring the messy Christmas delights the tank has on offer! Available to view on The Splat! Fan Club until Jan 1st 2019 - Club members can also download this video from The Fan Club to keep! Ivan took on his second pre-shoot for The Splat! Show in this festive special. 12 days of Splat! Christmas see's Ivan recive a special messy gift on each day of Splat! Christmas. An incredibly messy segment that features the single biggest gunging of the year 2018! Pre-shoot Exclusive: Only available to viewers who ordered before the close date. It was Ivan solo in his second Gunge Tank Vote for The Splat! Show. We gave the viewers the chance to choose Ivan's Christmas "present from the fans. A Tank full of beans or a tank full of rice pudding. Just getting to Splat today was a challenge. For the first time I was sitting on the train wondering if it would even get me to Splat HQ as there were so many issues on the line. I knew there was a lot to set up and prep and Pete wouldn’t be able to do it without me…. purely because I had half the stuff for today’s shoot in my bag! I hate the idea of keeping models waiting around so was anxious about getting things set up before Ivan arrived… except it turned out Ivan was on the same train as me and we actually spent the 10 minute walk to HQ chatting away merrily. He is impossibly nice, yes on screen there’s a rivalry starting between us (more of which later) but I don’t think I can say a single bad thing about him. He even offered to help carry the stuff up the hill. I was too much of a gentleman to let him though. Plus I really do think he is a very talented person and somehow it didn’t seem right letting the star do donkey work. Setup was done at a rate of knots (being a returner there wasn’t the whole health and safety stuff to go through) and we were off…. We did the catch up interview but Pete gave it a fantastic twist and then gave me free reign to be the “mouthpiece” of the tank. Any worries we might have had that his first show was a one off went out the window as Ivan gave us the goods again (and again and again). I sometimes wish there was a camera pointing out of the tank as you would really see just how much Pete and I struggle not to laugh at Ivan’s antics. What I really want to say though is you, the fans, have stood by Splat through everything. Today we wanted to repay you the best we could. There were three “fan special” segments today. One for the club, a vote and a pre-order. You put your trust in us and we really went with it. The gunge tank vote…. yes that really is THIRTY cans of rice pudding in the tank. Ivan’s comment about the smell IS for real. Yes, it was actually gross and yes, it left us with a big clean up job… but you guys are worth it. And as for Ivan’s 12 Days of Splat Christmas? If you pre-ordered that then I promise you you haven’t seen a gunging that intense before. Imagine a Splat storm but scaled up a factor of ten. It knackered us (meh, Ivan just sat there) because we really went for it. Tankings, buckets, foam…. you definitely got your 12 days, and about another week on top of it! I ache like crazy from that shoot. Every game was done on full with barely a pause between them. Tanks were filled, bucket upon bucket lifted, shifted and thrown. By the end there was a mini waterfall pouring down my face. But know what? Even by Splat standards that was an amazing shoot. Not just because of the fantastic gungings. Not just because Pete had put together an amazing set of games. But because Ivan brings an atmosphere with him that no other model does. Yes, other models are great to work with. Yes, I get on really well with some and we actually chat outside of the shoot as well…. But Ivan just has something about him that means the shoot is pure joy, even with the camera breaking down, the tank having issues, the trains causing stress, the gunge clean up being beyond rank….